Every employer does it. Your personnel file is a quick and handy reference for your boss. It not only keeps track of every important legal piece of paper relating to you, but provides a quick summary of who you are and what you do/what you’re owed/how you’re performing. Creating your own personnel file at home can be an invaluable tool that does just the same for you, but in reverse. In one place you can quickly reference anything you need related to your career. Whenever you have to do business of any kind with your current or future employer, you won’t be standing there empty handed when they pull out your file and have full records of your history. You’ll have a file of your own and can meet fact with fact, paper with paper. Your contracts. This means a copy of your signed contract that got you hired at your current job. Also, copies of your contracts at any and all previous jobs. There can never be any confusion about what you’re owed, what is expected of you, what was promised to you, or when and how your job will end… so long as you keep your own copy of all your contracts. Your most recent evaluation reports. Good or bad, you should request copies. If anyone starts to question your performance, your employers’ own evaluation of you work, in their own words, is invaluable. And if your performance was poor in the past, keeping lousy reviews can be helpful to demonstrate growth or improvement. Anything legal you sign at work. Such as: a noncompete agreement; a confidentiality agreement; an agreement relating to a company-provided property such as a car or a cell phone or a laptop; liability waivers; etc. Your W-2 forms and any related employment tax documents. Going back at least 3 years. Other possible documents to include: 1099s and W-4s (the Employee’s Withholding Allowance Certificates). Your benefits/retirement summary. And any other documents that highlight all the perks and benefits you’re entitled to under your contract. Your health and insurance benefits summary. As an addendum to the above, if you’ve got an outline of the health benefits you are due, make a copy and throw it in here also. You should obviously keep a separate health records file for yourself and your doctor, but a summary sheet can be included in your personnel file for reference purposes. This is especially useful if you lose your job… how much longer are you entitled to your benefits? Your financial contributions. To retirement (401k, IRA) or health insurance (life insurance), broken down monthly or yearly or both. How much have you kicked in? How much is your employer required to kick in? Have they done so? You might have to do this by hand yourself, but it’s also a good reference for you to help keep a gauge on how you’re doing with your long-term financial goals. Any formal proposals/memos/agreements you make with or submit to your employer. For example, a raise request, the proposal to create a new position/project or even a proposal to work from home. Grades/transcripts from college. Especially for younger professionals. Proof of attendance/completion of any training/seminar. Copies of awards or citations. Written references from previous employers or others related to your career. Termination documents from previous jobs. If only to prove/explain the circumstances of your leaving a previous position, these are good things to keep copies of. Business expenses. Travel expenses, mileage reports, rental car receipts, lunches, paper clips, etc. Warnings and/or other disciplinary actions/complaints with co-workers. If you don’t have any or all of these documents, ask for copies to be made. You don’t necessarily need the originals for everything. Just having a copy in your own personal personnel file will suffice to provide all the reference and evidence you’ll ever need. I will be entering the work force for the first time soon and I think this is a great idea. This is a great idea. 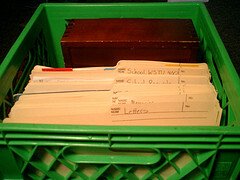 I actually have a filing system at home for all of my finances, but didn’t think to create one for my “Personnel” file. I could definitely use this to my advantage at my current workplace, since I can mention these things during my annual performance reviews. When you leave a job, chances are you’ll have a stack of business cards that are obsolete. Don’t pitch them! Keep several in your personal personnel folder, several in your “Brag Book”, several in a desk drawer at home, etc. If you’ve really got your act together, you’ll write your manager’s name and phone number, and the number for the HR department on the back. Years later, when you’re filling out a job application, security clearance form, or even a mortgage application, this information will be invaluable! Great addition to the list, Sysadmn. This is definitely a great idea. I’m getting ready to enhance my record keeping system and this will definably help. How long should you hold on to these (current + x previous employers?)? For things like health and insurance benefits summary which change every year, do you recommend keeping just the current or all? i’m having trouble with one of the ladies i just talked with she was no help at all and all i got was rudeness and she couldn’t even tell me how to create or locate the web site i needed to apply..it seemed as though i was putting her out..inconsiderate..